POLITICAL TIDBITS: Who can creditably head the Comelec at this crucial time? Who can creditably head the Comelec at this crucial time? With the resignation of Comelec Chairman Jose Melo, the crucial question is, who should be appointed by the President to head the poll body? Melo resigned five years ahead of his tenure that should end in 2015, and from his statements it was obvious that he was tired of the heavy burden he carried in the past two years, culminating in the first automated elections last May. Melo’s resignation comes when the Comelec is perhaps at the lowest ebb of its credibility and efficiency; it comes when the poll body is under the gun from professional IT organizations who have challenged before the Supreme Court its continuing refusal to disclose the automated election system’s source codes---the set of documents that governed its conduct with the electronics provider, Smartmatic-Total Information Management Corporation. Comelec is under attack for its lack of transparency. The question is, who can creditably head the poll body at this most crucial time, when it has to prepare and put into place two elections: the midterm elections of 2013 and barring Charter amendment, the presidential and local elections of 2016? President Aquino was quoted as saying that he is looking for a poll body chief who is “energetic, acceptable to all parties as neutral and professional.” In later interviews he added independent-mindedness as well as integrity. All of those are vital requisites for that toughest of jobs---one that has such a huge impact on the political stability of the nation. 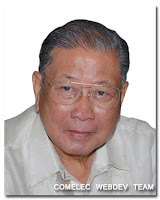 When former SC Associate Justice Jose Melo was appointed Comelec Chair by President Macapagal-Arroyo, I wrote in my column then in the Inquirer that I felt Melo was too old for the job. I wrote that a retired SC justice, no matter how sterling his record was, is not ideal person for the post of Comelec Chief. This is because that job calls for a far younger person who, as P-Noy put it, is “energetic,” strong and healthy enough to face the enormous challenges it offers. A second criterion should be acceptability to the political parties, and this can only stem from the perception that the poll chief is politically “neutral and professional,” as P-Noy put it. But perhaps the most critical criterion needed of the poll chief is integrity and incorruptibility. I think that in the minds of a number of citizens former Chair Melo remained relatively untainted by corruption; but by his own admission, there was a lot of corruption in the poll body and one easily infer that the corrupt there ran rings around the hapless former jurist, who came in as an outsider. This brings us to an important point: should the next poll chief be appointed from outside? P-Noy has indicated that he was inclined toward an “outsider.” To be sure, there are a number of distinguished lawyers with integrity and independent-mindedness, who would make an outstanding Comelec Chief. But there’s a difficulty to an outsider. I recall the favorable public perception about Wigberto “Bobby” Tanada when he was appointed to head the Bureau of Customs and Vicente “Ting” Jayme as Department of Public Works and Highways Chief in the Cory era, and Efren Plana at the BIR’s helm in the Marcos era. These officials were perceived as honest and untainted, but the popular perception too was that pinaikut-ikutan lang sila ng mga corrupt sa mga oficina nila. But if the new poll chief is to be recruited from inside, what guarantee is there that he or she has no links to the imbedded syndicates in the Comelec or can fight them enough to destroy them? Three prominent personalities are said to be seriously considered for the top Comelec job: Justice Secretary Leila de Lima, who began as an election lawyer, and election lawyers Romulo Macalintal and Sixto Brilliantes. These personalities command respect among their peers and there are indeed merits to appointing an election lawyer to that post, as he or she would be conversant with all the tricks in the election trade. But the negative side is that election lawyers may have become quite close to various politicians in the course of their career and their opponents could be easily suspicious of their neutrality. Besides, don’t we have any other character of integrity, fearlessness and independence aside from Leila de Lima? To be sure, she is the most credible and perhaps the only performing member of the Aquino Cabinet at the moment; but I hope the President won’t entice her away from the Department of Justice, where she has to oversee the “trial of the century,” the Ampatuan mass murder trial, from the prosecution end. Like that biblical episode about the Lord searching for honest people so as not to destroy a city, there must be a few other honest souls in this fair land who can be considered for the top Comelec post and two other vacancies there next year. In his press statement resigned Chair Melo more than hinted of the corruption in the Comelec. Professional and citizens’ groups such as the Center for People Empowerment for Governance (CenPeg), the Automated Election System (AES) Watch led by former Vice President Tito Guingona, and the group of lawyer Dindo B. Donato have questioned before the Supreme Court the many irregularities that attended last May’s first automated elections, including the malfunctioning of many PCOS machines. CenPeg particularly pressed the SC to enforce its earlier order to compel the Comelec to disclose the source codes that governed the poll body’s regulation of Smartmatic in the last elections. Cenpeg maintains that disclosing the source codes is the only way IT professional groups could conduct an independent review of the automated elections---before we resort to another automated exercise. The AES Watch, on the other hand, has asked the SC to make public 21 “vital public documents” pertaining to its contract with Smartmatic. But the Comelec has stubbornly ignored not only the clamor of citizens for these documents, but the very order of the SC itself. Under Chairman Melo the Comelec had resisted producing these vital documents. Can his successor cooperate with those groups clamoring for their revelation? Former Comelec Chair Christian Monsod, in his lecture at the Jaime V. Ongpin Foundation early last month, reinforced the criticism about the poll body’s failure to be transparent. He pointed out the general agreement among various stakeholders that there is a need for a thorough review of the AES system and for corrective measures if it was going to be used again. The main disagreement, he stressed, is “in the process, its efficacy, its security and even its accuracy at certain levels.” But he also noted that the problem was that “the Comelec has made it difficult to find out in any objective manner the answers to the questions raised (by the other stakeholders). Monsod quoted from the testing firm SysTest how “vital it is for the Comelec to share factual information about the automation and testing processes to accurately inform the public, including groups most critical of the automation project (such as CenPeg---BOC), and to de-bunk misinformations and rumors.” Unfortunately, he said, the Comelec and Smartmatic did not heed the advise, hence the damage to their credibility. The judicially activist SC should order the Comelec, under pain of stiff penalties, to disclose the source codes. And as the poll body gets a new chief, the citizens look to a new climate of transparency there.